A few years ago, I began reading posts by a woman on the Phoenix Theory forum with the unusual screen name of "jadekf." At the time, she was teaching herself Phoenix Theory, using the books and tapes she bought online, progressed to speedbuilding, again using online resources, and finished her training in about two years ... then she got herself a job doing captioning. A couple years ago, I asked her if she would write an article on captioning for Cheap and Sleazy. She agreed, but she was in the middle of a move -- from Melbourne, AUS to Hong Kong ... not to mention the language barrier she had to overcome. It took a while, but I finally got Jade to write this article for me! I hope you enjoy it. I should briefly explain how I got into stenography in the first place. I was straight out of high school, had deferred my university course after six weeks out of complete disinterest, and was flitting from casual job to casual job. I had a stint in a call center, a sports store, and a florist. It was while I was working as a general dogsbody in the office of Melbourne's pre-eminent forensic psychologist that I had my first exposure to court reporting. The good doctor appeared often in high-profile court cases, and sometimes I typed up his case notes. One of the ladies on the typing pool put me in touch with a court reporting company when she saw I could, frankly, type like a demon, and off I flitted to yet another "short-term job" - except, I LOVED IT. I remember 19-year-old me blushing with shame at not knowing what "interlocutory" meant, much less how to spell it, during my interview. Inability to spell basic legal terminology notwithstanding, I was offered a job as a typist. After a while I began scoping for one of the stenographers there. I had realised capturing words for posterity was where my heart lay; but I knew I didn't want to be a typist. I liked scoping, but I wanted to be a stenographer myself. Where I grew up, in Melbourne, Australia, there's no court reporting school (it's a MUCH smaller industry there than elsewhere), so I looked around online and bought the Phoenix Theory materials and a Smartwriter and proceeded to teach myself the theory at home. 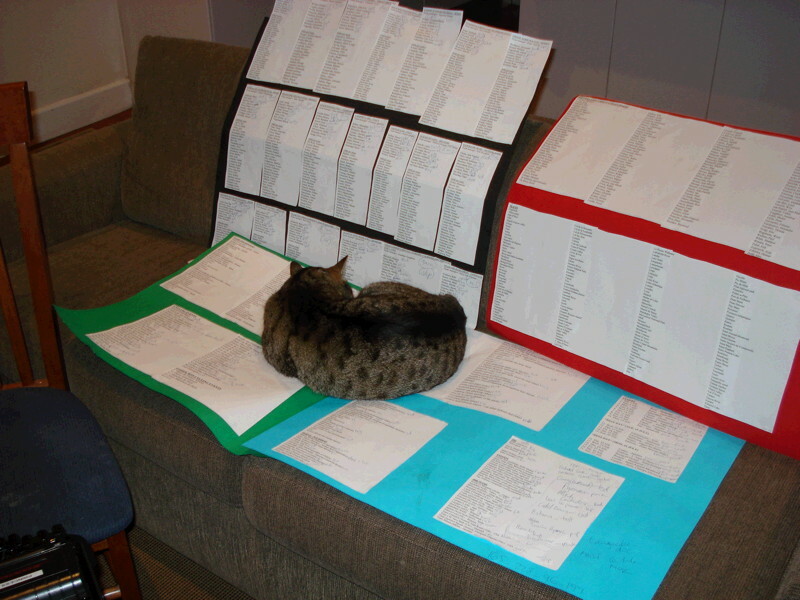 I was very lucky to have access to CAT software at work, which was invaluable in those days of still living at home and spending all my pennies on foolish weekend pursuits! I still feel the outrageous start-up costs for equipment are probably keeping good people out of this profession. I completed my theory in about four months - it was interesting, logical, and pleasingly progressive. I continued scoping full-time at work, building up my knowledge of legalese, Latin, medical terminology, and courtroom procedures in various jurisdictions. Scoping was invaluable in helping me consolidate my theory principles, even though I wrote a different theory to Christine, the fabulous near-perfect writer I scoped for. Reading steno all day helped compensate for the fact that in the first year after learning theory, I did very little speedbuilding. When I did finally buckle down, I had few word-construction hesitations. From about 120wpm onwards I was able to start doing pre-recorded tapes of cases with delayed transcript requirements (most are daily turnaround in Australia). I know I was lucky to have an employer who was willing to pay me from 120wpm! He was a renowned pen-shorthand writer with a passion for court reporting who was always prepared to foster those with a similar affinity. As I mentioned earlier, court reporting is a small, tightly held industry in Australia. I felt I had to prove myself elsewhere before coming back to that seat between bar and bench. I applied for, and got, a trainee position at Channel 7, one of the four major commercial Australian networks. The six months I spent "training"(with daily live stints doing the national 4.30pm news bulletin) were what I needed to push up to the high speeds required. I became a "proper stenocaptioner" and enjoyed writing everything from daily news and current affairs to special live events and sports. The constant thought that up to 4 million people could be watching my work at any one time provided a very definite positive pressure. A couple of years into my captioning career, my entire department was outsourced to Red Bee Media (formerly Australian Caption Centre). This opened up opportunities to caption also, by means of technology like international tielines, 24-hour news on the BBC for UK viewers; and CART for university students and corporate meeting participants across Australia. Some of my captioning highlights include covering the Ashes, the Australian Open, Wimbledon, the Tour de France, the Olympics, the Melbourne Cup, and the AFL Grand Final (why yes, I am a sports fanatic!). Sports captioning is a unique challenge, in terms of the horrendous and never-ending amount of dictionary prep required, the really high speeds commentators speak at, and particularly being able to write well while suppressing cheers/despair! Two other "events" that stand out from my time captioning network television: the Boxing Day tsunami, and the London Underground bombings. Naturally these are not "highlights" but being exposed to the backhaul (unedited) feed of vision from the scene, and writing for hours/days on end, put other jobs ("Sunrise" advertorials, I'm looking at you ...) in perspective. There are a lot of differences between court reporting software (I used Case Catalyst previously, and currently use Eclipse) and captioning software. All my captioning was done using proprietary software originally developed by, say, the BBC, with a deceptively simple DOS-looking screen. There is a buffer zone built into this software, a time-out period, if you like. 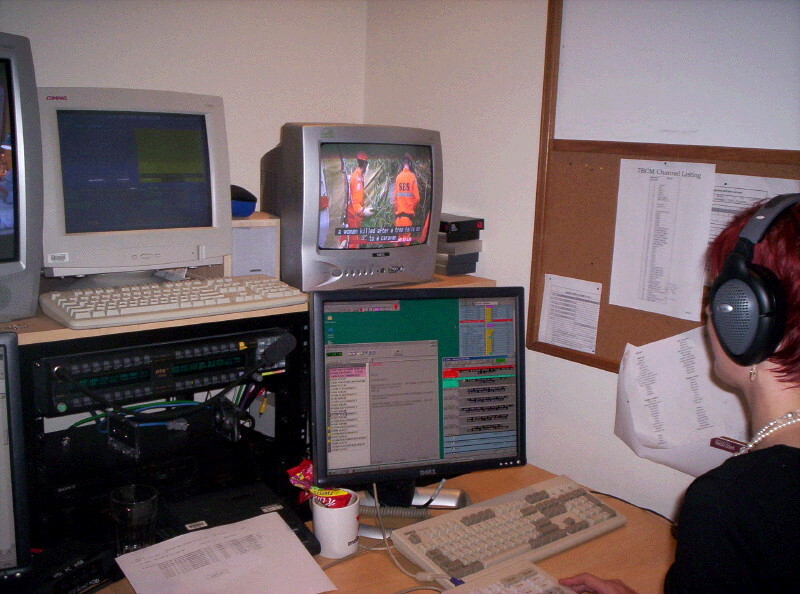 It's to ensure the captions get into the signal and onto people's television screens at about the same time as the relevant vision. What it means is if you put down the first stroke of a word, then hesitate longer than 0.75 seconds (or whatever notional amount the network sets) before putting down the second stroke, the software won't glue them; they'll just appear as two discrete strokes. The same goes for deleting. If you make a mistake and don't hit your asterisk within the buffer period, it won't work. Or, if you have, say, something like Australasian College of Colorectal Physicians defined with initial caps thusly, and it takes you longer than 0.75 seconds to get it all out, it won't be capped or formatted properly. That has been difficult to get used to, but I think has actually been beneficial to my writing style -- it has forced me to be a confident, more rhythmic writer. Then there's all the formatting strokes. In Australia, captioning is coloured and mixed-case. In that regard, I'd imagine it would be slightly easier to caption in America, given it's all in white and upper case, regardless of the speaker. In Australia, the first or primary speaker is white, the second speaker is yellow, the third speaker is cyan, the fourth speaker is green, and the colours are then rotated backwards and forwards throughout the segment/show. So we have to remember which colour we assigned to each person, as well as executing the colour-change strokes between captions. I changed the stroke I used in court reporting for "new question" to "change to white," the stroke for "answer" to "change to yellow," the stroke for "His Honour in margin" to "change to cyan," etc. Another change that was crucial was adopting a "push" stroke (or a "flush" stroke, as it's called in Eclipse). As trainee stenocaptioners we were quickly taught to use our "push" strokes with extreme prejudice as often as we could, i.e. almost every sentence. The race was always on to keep up with the vision and give deaf and hard-of-hearing viewers as much of the information hearing viewers were receiving as possible. Equally as important was the "clear" stroke which theoretically prevented our captions from hanging over onto a commercial break, or obscuring a map or graphical information. We also had to be able to shift our steno around the screen to avoid obscuring people's faces, necessitating the learning of even more function strokes. We learned to create a phonetic table which was used in conjunction with our personal dictionary and any job dictionaries. This is so if we misstroked something, the viewing public will at least see a rough phonetic guide to the word so they'll have some idea what's going on, instead of seeing an untranslated steno stroke on the screen. In court reporting it's preferable to sit about a sentence behind the speaker to get a feel for the context and make it easier to punctuate accurately the first time around, instead of leaving it for a scopist to tidy later. In captioning, there's the double-whammy of not HAVING a scopist, or anyone at all, checking your work, and also the necessity of writing everything as soon as you hear it because if you don't, by the time it gets onto the screen, the relevant footage will have disappeared and it won't make sense to viewers. Although the content of TV programs is generally a lot 'easier' than court proceedings, it's a LOT faster. This necessitates some editing. Not only is it not possible to take down four speakers all interrupting each other and speaking at 280wpm or so, it's actually not possible for people at home to read that fast, nor for it even to all fit on the screen. So in those instances, it's up to the stenocaptioner to provide the most accurate precis of what's going on. Captioning improves your speed and it also improves your editing-on-the-fly chops. There's also a reasonably daunting technical side to the job. Stenocaptioners need to know how to patch their output into the signal using a router before a broadcast begins, according to a master allocation from the network. Basic troubleshooting abilities are also imperative for those on-air disasters that happen to everyone. Most captioning in Australia is done onsite, either at the network or in a nearby office space, as with Red Bee Media (http://www.redbeemedia.com.au/index2.html). A typical shift might involve some inputting of pre-recorded shows for the offline department; a couple of hours of reading newspapers and dictionary prep (a part of the job which never ends -- your dictionary will NEVER be good enough! ), interspersed with hourly local news update; and then live-captioning of the 6 pm news, and maybe another live show in the evening, or another market's 6 pm news which falls in a different time zone; and then maybe one other live show, perhaps Dancing With The Stars or a football game or something. 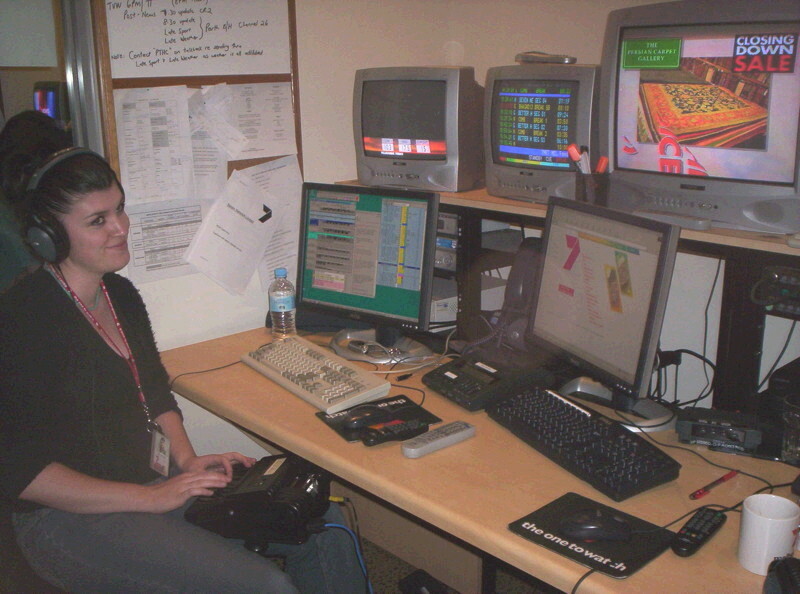 Here's an old and rather awkward photo taken in a captioning booth onsite at Channel 7 in Melbourne. You'll note I'm using a 400SRT. This seems to be the machine of choice in Australian captioning -- cheap, reliable, does the job! It's necessary to watch your output off the TV screen anyway so you can see what the viewers see, so spending your hard-earned dollars on a newfangled machine complete with LCD screen and readback-assisting technology is simply, ironically, redundant. 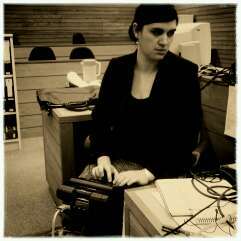 This next photo is of Steph, the captioner. For the regular news, we work in teams of one stenocaptioner plus one captioner. The captioner cues out the pre-prepared captions for any stories we may have got accurate scripts for during the afternoon, and the stenocaptioner writes any true live bits (because, even as passionate stenographers, we can't deny pop-up captions are easier to read than scrolling). Steph cues the pre-prepared captions from her computer using the funny little keypad on the desk. 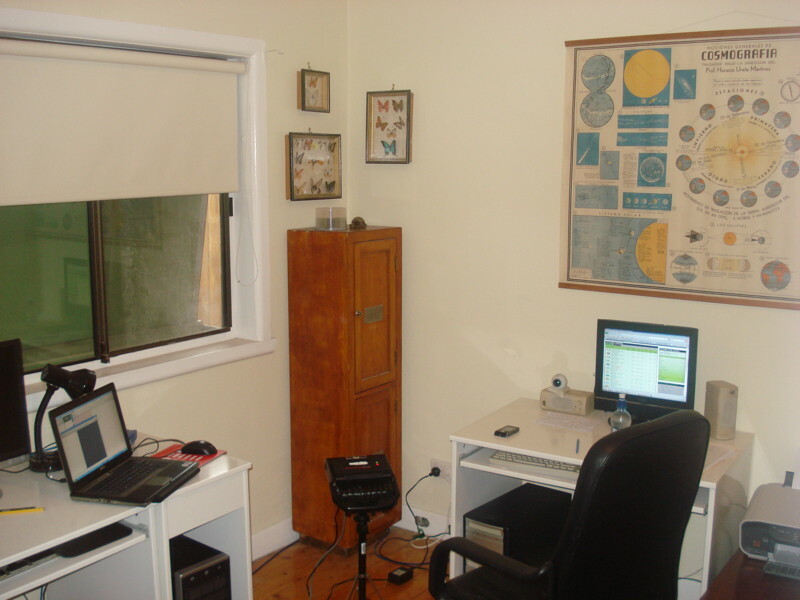 There is some scope to work from home in Australia, but it's certainly not the norm, as it seems to be in America. In some instances it's allowed, and preferable, when the broadcast hours are ludicrous and no-one wants to open up the office for you! See here my couch covered in thousands of French and cycling-related shortforms. Cat not relevant, but strangely heartwarming after four hours following the pelaton through the mountains. After the birth of the very child gestating during that particular Tour, I worked from my home "office", mainly doing CART. Here is my very simple set-up. 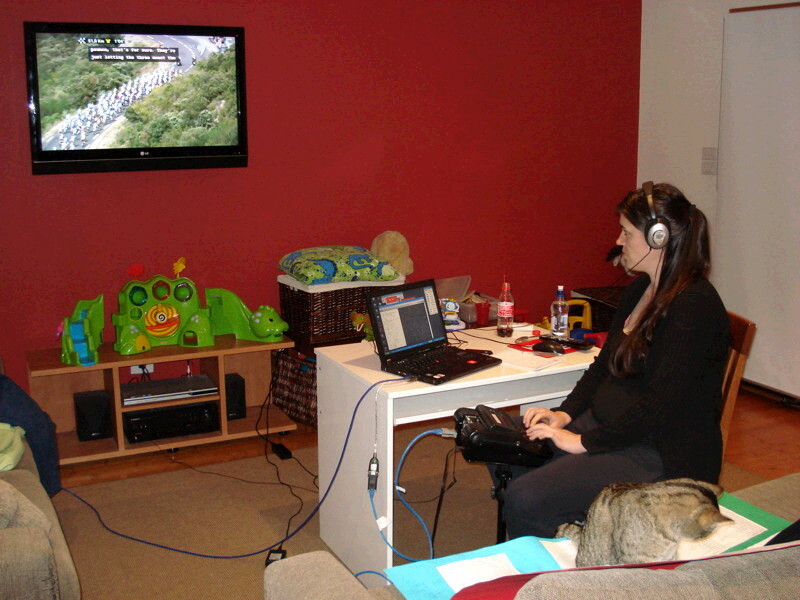 Captioning allowed me to come into my own as a writer, gave me a technical grounding, and an incredible amount of flexibility when both my kids were aged under 3. The threshold for mandated captioning is rising every year and so the hours of work available can fit in with any lifestyle. We did without formal childcare for a good part of the last four years because my schedule was generally predictable and could be worked around family commitments. Stenocaptioning, in Australia at least where there are very few stenographers and no schools, is currently a very well-remunerated career. My salary was around AU$120,000 (US$121,200) a year for a 40-hour working week, with six weeks annual leave. So why would I leave what was certainly a dream job and move to a small fishing village in the South China Sea, only to traipse down a sub-tropical forest path every morning and risk my life on a famous Hong Kong minibus over the city to work in the marvelously colonial High Court of this astonishingly constrasting world city? I guess that's a story for another time. Thanks for having me, Glen! The author hard at work in the highest court in the land, on her old faithful 8000LX, possibly taking down a Triad murder trial or some juicy expatriate embezzlement case.